The 8700i’s dual power supplies with independent AC line inputs provide redundant operation to ensuring maximum uptime. Analogue and AES3 digital inputs and outputs have hard-wire safety bypass relays in case of hardware or power failures. Dante provides a dual-redundant Ethernet connection for two stereo audio inputs and two stereo outputs, each with a dedicated level control. Sample rate conversion is provided for both the inputs and the outputs. Full AES67 compatibility is coming Fall 2017 via an easy, free software upgrade. The 384/192 kHz AES3 digital composite output that is compatible and interoperable with the 192 kHz standard being implemented by several transmitter manufacturers. single-frequency-network (SFN) and near-single-frequency-network (N-SFN) operation. Used with the 8700i’s remote control application, the streaming monitor facilitates checking or improving your station’s signature sound when you are unable to receive the 8700i processed FM signal off-air. The steaming feature allows you to monitor several points within 8700i. The MP3 and OPUS codecs and the Icecast2 and SHOUTcast2 streaming protocols are supported, allowing streaming directly to the client PC via your LAN or the Internet. The Subharmonic Synthesizer creates energy one octave below program energy in the range of 50-90 Hz when such energy is not present at the input and when music is detected. It adds punch and slam to older material while retaining musicality. The Xponential Loudness™ algorithm reduces listening fatigue and actually improves listeners’ hearing using adaptive psychoacoustics. It revives music that has been “hypercompressed” in mastering and/or passed through lossy compression, like MP3. It’s like an audio magnifying glass that brings out hidden detail, clarifying audio and inspiring audiences to listen longer. The phase skew corrector maximizes both FM and Digital Radio processing paths for the quality of a mono mixdown or blend that might occur in a receiver or player device. An improved BS-412 Multiplex Power Controller provides a new user-adjustable, program-adaptive algorithm to make operation smoother and more subtle. Follows standard 50µs or 75µs pre-emphasis curve ±0.10 dB, 2.0 Hz - 15 kHz. Analogue left/right output and Digital output can be user configured for flat or pre-emphasized output. Output noise floor will depend upon how much gain the processor is set for (Limit Drive, AGC Drive, Two-Band Drive, and/or Multiband Drive), gating level, equalization, noise reduction, etc. It is primarily governed by the dynamic range of the A/D converter, which has a specified overload-to–noise ratio of 110 dB. The dynamic range of the digital signal processing is 144 dB. <0.01% THD, 20 Hz - 1 kHz, rising to <0.05% at 15 kHz. <0.02% SMPTE IM Distortion. > 55 dB, 20 Hz - 15 kHz; 65 dB typical. Absolute polarity maintained. Positive-going signal on input will result in positive-going signal on output when HD Polarity and FM polarity controls are set to POSITIVE. 0.27 to 12.0 seconds, adjustable in one-sample increments at 64 kHz sample rate to allow the delays of the analogue and digital paths in the HD Radio system to be matched at the receiver output. The relative delay between the HD and analogue FM outputs stay constant regardless of the structure in operation. The delay can be changed via 8700i PC Remote software, via SNMP, and via Telnet-style (terminal control) commands through the serial and Ethernet ports. Several manufacturers make HD Radio monitors that can adjust the 8700i’s diversity delay via terminal control to compensate for changes in HD delay that might occur elsewhere in the transmission system. To avoid introducing artifacts in the analogue FM path, its delay is held constant and HD delay is varied if the adjustment does not exceed ±1.3 seconds. Processing structure dependent. Typically 17 ms for normal latency Five-band, 13 ms for low-latency Five-band, 3.7 ms for ultra-low-latency Five- band, and 17 or 22 ms for 2-band, depending on crossover structure chosen. MX presets have approximately 270 ms delay. The multipath mitigator adds 146 ms of additional delay, and can be bypassed in situations like outside broadcasts where talent needs to monitor off-air. The defeatable subharmonic synthesizer adds 67.5 ms of delay when active. > 10kΩ load impedance, electronically balanced. Software adjustable from –4.0 to +13.0 dBu (VU). 24 bit 128x oversampled delta sigma converter with linear-phase anti- aliasing filter. Stereo. The analogue output can emit the analogue FM processed signal, the digital radio processed signal, or the low-delay monitor signal. The FM processed signal can be flat or pre-emphasized (at 50µs or 75µs), software-selectable. 50Ω, electronically balanced and floating. 600Ω or greater, balanced or unbalanced. Termination not required or recommended. Adjustable from –6 dBu to +24 dBu peak, into 600Ω or greater load, software-adjustable. > = 90 dB unweighted (Bypass mode, de-emphasized, 20 Hz - 15 kHz bandwidth, referenced to 100% modulation). <= –70 dB, 20 Hz - 15 kHz. <= 0.01% THD (Bypass mode, de-emphasized) 20 Hz - 15 kHz bandwidth. Removing power from the Optimod will connect the left and right audio inputs to the left and right audio outputs via a relay. 32 kHz, 44.1 kHz, 48 kHz, 88.2 kHz, and 96 kHz automatically selected. XLR-type, female, EMI-suppressed. Pin 1 chassis ground, pins 2 and 3 transformer balanced and floating, 110Ω impedance. Variable within the range of –30 dBFS to –10 dBFS. Removing power from the Optimod will connect the Digital Audio Input to Digital Output #1 via a relay. Two outputs, each stereo per the AES3 standard. The outputs can be set independently to emit the analogue FM processed signal, the digital radio processed signal, or the low-delay monitor signal. The FM processed signal can be configured in software as flat or pre-emphasized to the chosen processing pre-emphasis (50µs or 75µs). The HD processing chain receives the output of the multiband limiter and processes it through a look-ahead peak limiter that operates in parallel with the main FM peak limiting system. The HD and FM signals are always simultaneously available. Each output can apply J.17 pre-emphasis if desired. Internal free running at 32 kHz, 44.1 kHz, 48 kHz, 88.2 kHz, or 96 kHz, selected in software. (Use 44.1 kHz or higher for best peak control.) 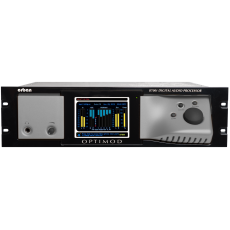 Can also be synced to the AES3 SYNC input or the AES3 digital input at 32 kHz, 44.1 kHz, 48 kHz, 88.2 kHz, and 96 kHz, as configured in software. Software selected for 24, 20, 18, 16 or 14-bit resolution. First-order highpass noise-shaped dither can be optionally added, dither level automatically adjusted appropriately for the word length. XLR-type, male, EMI-suppressed. Pin 1 chassis ground, pins 2 and 3 transformer balanced and floating, 110Ω impedance. –20.0 to 0.0 dBFS software controlled. For output sample rates of 44.1 kHz and above, the frequency response from input to HD-configured output is ±0.10 dB, 2.0 Hz - 20 kHz; flat or with J.17 pre-emphasis applied. The user may specify lowpass filtering to constrain the bandwidth to 15, 16, 17, 18, or 19 kHz. Two L/R stereo inputs and two L/R stereo outputs. The outputs have the same configuration options as the AES3 outputs (above) except for the sample rate. Inputs and outputs support 44.1 kHz, 48 kHz, 88.2 kHz, and 96 kHz. Input locks automatically to the incoming sample rate; out sample rate is software-selectable. 2x RJ45, dedicated solely to the audio-over-IP connection. Supports redundant network operation. 32 kHz, 44.1 kHz, 48 kHz, 88.2 kHz, and 96 kHz, automatically selected. Removing power from the Optimod will connect the Digital Sync Input to Digital Output #2 via a relay. Accepts 1x wordclock or 10 MHz reference signals, automatically selected. The DSP master clock can be phase-locked to these signals, which in turn phase-locks the 19 kHz pilot tone frequency, facilitating single-frequency network operation. The digital output sample frequency can also be locked to these signals. Unit will lock to 1x wordclock and 10 MHz squarewaves and sinewaves having a peak value of 0.5 V to 5.0 V.
BNC female, grounded to chassis, non-terminating to allow reference signals to be looped through via an external BNC “tee” connector (not supplied). Standard double sideband mode or compatible single sideband/vestigial sideband mode with SSB/VSB crossover at 150 Hz. SSB/VSB mode adds approximately 12 ms of delay to the composite output signal. 0Ω voltage source or 75Ω, jumper-selectable. Single-ended, floating over chassis ground. 37Ω or greater. Termination not required or recommended. –12 dBu (0.55 Vp-p) for 0.5 dB adjustment resolution. 19 kHz, ±0.5 Hz (10 degrees to 40 degrees C). <= 85 dB (Bypass mode, de-emphasized, 20 Hz - 15 kHz band- width, referenced to 100% modulation, unweighted). <= 0.02% THD (Bypass mode, de-emphasized, 20 Hz - 15 kHz bandwidth, referenced to 100% modulation, unweighted). At 100% modulation = 3.5Vp-p, > 60 dB, 30 Hz - 15 kHz. At 100% modulation = 1.0 - 8.0 Vp-p, > 55 dB, 30 Hz - 15 kHz. <= –80 dB, main channel to sub-channel or sub-channel to main channel (referenced to 100% modulation). > = 70 dB (referenced to 100% modulation). > = 80 dB (referenced to 100% modulation). > = 70 dB (referenced to 100% modulation; with up to 2 dB composite limiting drive; measured with 800 line FFT analyzer using “maximum peak hold ” display). 0.047µF (0Ω source impedance). Maximum cable length of 100 feet / 30 meters RG–58A/U. The composite baseband is internally sampled at 384 kHz and alternate samples are placed on the left and right audio channels. With compatible receiving hardware, this allows the entire baseband frequency range (0 to 99 kHz) to be accommodated without aliasing. If the frequency range of the SCAs applied to the digital output is limited to less than 96 kHz, this is fully compatible and interoperable with the existing system adopted by the industry, which uses only the left channel at 192 kHz. Variable from 220 mV p-p to > 10 V p-p to produce 10% injection. Sensitivity of analog inputs is screwdriver-adjustable by trim pots that are accessible through holes in the rear panel. Sensitivity of digitizing inputs is adjustable in software. 2 x BNC, unbalanced and floating over chassis ground, EMI suppressed. The SCA1 input can be configured to accept the composite output of a backup audio processor or stereo encoder; removing power from the Optimod will connect this input to analog composite output #1 via a relay. Variable from 220 mV p-p to > 10 V p-p to produce 10% injection. Sensitivity of analogue inputs is screwdriver-adjustable by trim pots that are accessible through holes in the rear panel. Sensitivity of digitizing inputs is adjustable in software. Analogue SCA2 input jack can be jumpered to provide a 19 kHz pilot reference output or to serve as a second analogue SCA input. The phase of the reference signal can be set to 0°, 90°, 180°, or 270° with respect to the pilot tone appearing at the composite output. The default is 0°. IBM-compatible PC running Microsoft Windows® Vista/7/8/8.1/10. TCP/IP protocol via direct cable connect, modem, or Ethernet interface. Modem and other external equipment is not supplied. RS–232 port (3) DB–9 male, EMI-suppressed. Serial Connector 1 uses PPP to provide for direct or modem connection to the 8700i PC Remote application. Serial Connector 2 supports communication to a computer or remote control system via simple ASCII commands for administration and recalling presets. Serial Connector 3 is reserved for future developments. Female RJ45 connector for 10-1000 Mbps networks using CAT5 cabling. Native rate is 100 Mbps. Provides for connection to the 8700i PC Remote application through either a network, or, using a crossover Ethernet cable, directly to a computer. User-programmable for any eight of user presets, factory presets, bypass, test tone, stereo or mono modes, analogue input, digital input. 30 VDC positive. Protected against reverse polarity by a diode; do not exceed 50 mA through this protection diode. 30 mA; current must be limited externally. 100–264 VAC, automatically selected, 50–60 Hz, 50 VA.
Two supplies are included with automatic failover. IEC, EMI-suppressed x 2. Detachable 3-wire power cord supplied. 19” x 5.25” x 15.5” / 48.3 cm x 8.9 cm x 39.4 cm. Depth shown indicates rack penetration; overall front-to-back depth is 17.75” / 45.1 cm. Three rack units high. 30 lbs / 13.6 kg - 25" x 24" x 9"
Because engineering improvements are ongoing, specifications are subject to change without notice.